This is the Olight M2R Warrior , sent to me for review from Olight and NO other compensation other than keeping the light for my review. The M2R warrior came in a padded mailing envelope and the Olight box inside that. When I took the Olight box from the package I found a very attractive box , with everything very clearly labeled and very well packaged as I progressed through the unpacking process. Each step of the way there are printed instructions showing / telling what needs to be done next , or what a certain part of the light does or how to use it. Once I had everything out of the box I found the light also attractive for my personal taste. It is a tube light in a sense but yet made to be a tactical light with big output. I really like the blue bezel with the small cuts in it making for a unique design on this light. The size and the feel of the M2R are both very good in my opinion and it fits my hands well. The light does not have traditional knurling , but instead has a ribbed type pattern , with lateral lines running through that , the length of the tube and small matching lateral lines on the head and the tailcap portions. In the below GIF the light size comparison is from left to right…. BLF A6 , M2R and Thorfire TK15 S on the right. The M2R comes with a magnetic charger that charges the included cell , or any other cell from my understanding that will fit , through the tailcap. The cell that is included is listed as a High drain 3500mAh protected cell with 10 amp discharge and 12.6 mh. Olight however DOES RECOMMEND A PROTECTED CELL. I tried several cells in the light and all appear to function as they should. Included were LG HE4 button top , LG HG2 flat top , Efest purple high drain flat top , and a LG MJ1 button top. There is also a very nice nylon holster included with a clasp type closure instead of the normal velcro. The holster can be used on a belt , hooked onto your back pack with the built on eye and even has a separate snap closure that is made onto the belt loop portion. The M2R utilizes the XHP 35 emitter (HD) or dome on and this one IS a NEUTRAL WHITE (also to my liking personally), and has a constant current driver from what I can see of it. The reflector is an OP with somewhat of a hotspot and decent throw for an OP reflector in a small head light , while giving a good coverage area at the same time. There is also a DTP copper board the XHP 35 sits on , so added bonus there. The M2R has a tail and a side switch both , and a “Standard” or “Tactical” mode setting. The tail switch is a “Tactical” switch for the Turbo and / or Strobe functions only. (In the following statement the Standard and Tactical modes are just the opposite of the way I listed them , although other than that I think I got it right for the most part. )….In the STANDARD mode , with a half press , the tail switch activates Turbo only and with a full press it activates the Strobe only. No matter which mode you go to with the tail switch in standard mode though , the light goes back off when the tail switch is released. If you turn the light on with the side switch , no matter what mode you are in , a quick press of the tail switch will turn the light back off without having to use the side switch. The second mode group is the “TACTICAL” group. This setting lets you use the tail switch for either momentary on of the Turbo mode with a half press, or constant on of the Turbo mode with a full press of the tail switch, with NO strobe function. One odd thing I discovered when in the “Tactical” group (I think)? the Turbo mode only gives 1125 lumens instead of the 1570 lumens that the STANDARD mode gives at or after the 30 second mark and leveled off , whether using the tail switch or the side switch to go into Turbo. I think if I am not mistaken , this is the way the light (driver is designed though , if I am reading the listed specs right from the Olight site. The M2R does have mode memory from the side switch and will go back to the last used mode when the light is turned back on. The moon mode is separate with it being activated by a long press of the side switch , but it too will be memorized if the light is turned off while in moon mode and will come back on in moon. The only mode that does not memorize is the Turbo and strobe , which are both very easily activated from the tail switch. The rest of the modes can be switched by either holding down the side switch and scrolling through , or by pressing the side switch for about 1/2 second and releasing when the next mode pops up. This includes if you are starting at the moon mode and scrolling up from there. A quick click of the side switch turns the light off from any mode. Turbo can be accessed from the tail switch or a quick double click of the side switch either way and the strobe can be activated from the side switch with a quick 3 clicks , or the tactical tail switch function. When in Turbo mode there is a 3 minute step down but , the light can be bumped back up into the Turbo mode once it steps down. I would highly recommend checking how hot the light is before going back into the Turbo mode though , as it does start getting pretty hot if it is warm with little or no airflow over the light. From what I understand there IS a THERMAL SENSOR in the light , so if it is too hot you may not be able to step back up instantly. One thing everyone should be glad to hear is…….. 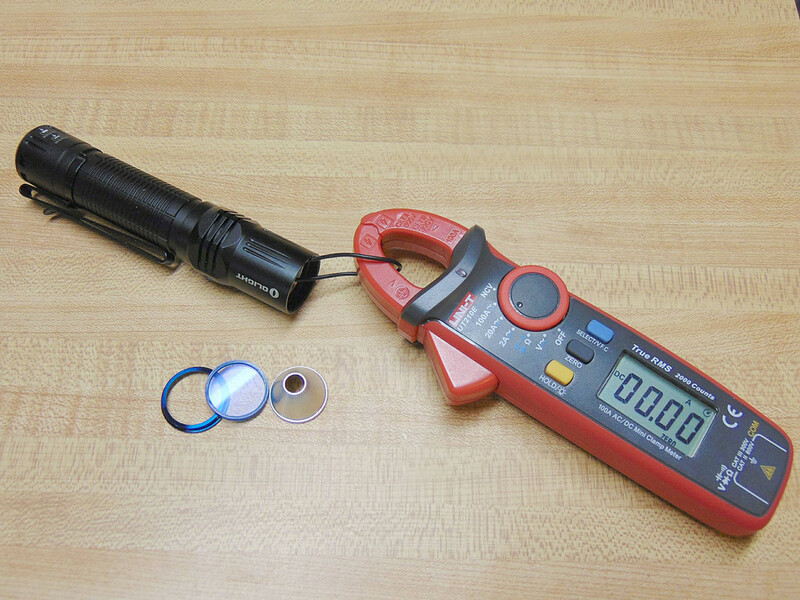 The tailcap DOES NOT short with a key , a coin or even a piece of 20 awg Turnigy wire pressed against the outer ring and the switch button at the same time. This means Olight addressed the problem that was present in the H2R headlamp that some were complaining about , and NO chance of shorting out of the M2R because of the magnetic tail charging system. I am sure it is how they set up the inside of this light though with the double tube design. By this I mean there is actually a tube inside the outer tube that can carry the current instead of the single tube design carrying the current as we are used to seeing , it flows through the separate tube making it possible to separate the outer and inner portions on the tailcap and the light tube both.. Some may not like the “Tactical” only tail switch , but for those of us who know how handy it can be in certain situations , it is a great thing to have. I was a prison guard for 14 years and a Peace officer (LEO) for 12 years and I would have loved to have a light with the Tactical only tailswitch during any or all of those years to be honest , but that is again my personal preference and yours may vary. Any way it goes , I personally think this will become one of my top 5 lights of preference with the USB magnetic charger for when I am in a vehicle , output , ease of use (for me) and just the overall styling of the light. I like it a lot !!!!!!!! ****Note the runtime testing was terminated by me at 190 minutes as I was getting too sleepy to hold my eyes open at the time. I dont think the light would have lasted much longer though becasue the LVP would have turned it off I am sure very soon anyway with the cell at 2.79 volts already when I checked it at the time. Much to my surprise the bezel wasn’t locked down with glue like I am used to seeing with Olight , so I was actually able to get to the emitter and test directly what the current was from there instead of trying to figure out how this new double tube design carries current to get a tail amp reading. 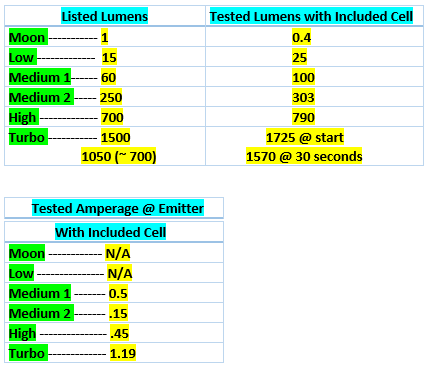 Below you will find the charts of the Runtime and Amperage testing (at the emitter) I did with the M2R , as well as the listed lumens and my actual tested lumens………. For those who don’t want to see the whole video , the still pictures (I think 35 of them) of the light and the beamshots (12 of those)start at 11:26 of the video timeline and the outdoor live footage comparing the Olight H2R and the Manker E14 II starts at 16:32 of the video timeline. Here is a few of the beamshots that are in the video , taken from 25 and 50 yards in modes…. Med 1 , Med 2 , High and Turbo…….. Unique Characteristics •High voltage 3500mAh 18650 lithium ion battery included, deli vering a maximum output of 1,500 lumens. •Comfortable and firm grip with ergonomic knurling allowing the user to operate the tailswitch naturally without even looking at it due to it’s smooth, barrier-less tail cap. •Aside from momentary or constant turbo from the standard operation mode, the light also features an enhanced tactical mode for one click instant access to strobe. •Compatible with all conventional 18650 batteries. •Rechargeable through the included 5V 750mAh OLIGHT USB magnetic charging cable or the optional OLIGHT Micro-Dok (II or above). nice light, like a lot of the design features, thanks for sharing! Thanks…….Always glad to do the reviews TM. For those with limited bandwidth or who don’t want to watch the video I have updated the OP with some Gif’s of the light and some beamshots also. Nice! I’m finding more and more to like about Olight. The little S1A I got recently in all copper with PVD coating is really well made, their small lights are special, their big lights are really nice too but on the expensive side. Very thorough review, like the beamshot differences that really show what to expect. I like the Olights so far for the most part. I do like a lot of their small lights also. I don’t think there has been the “perfect” light made yet to be honest , but things are getting closer to it all the time with these lights. I think you have it backwards, Standard is momentary-constant and Tactical is – Momentary-Stobe with 1500 lumens. Yea I meant to correct that after I got the review all posted and went back and looked , thanks for reminding me though , will point that out in OP. No problem. Great light just wished the 1500 lumens was in momentary-constant instead of just momentary-strobe. Never know they may come out with the M2R-2 or something like that with an upgraded UI in it later. Something I just learned with the M2R, I had it in my mouth holding it while my hands were full, my tongue touched the magnet and button. I got shocked. 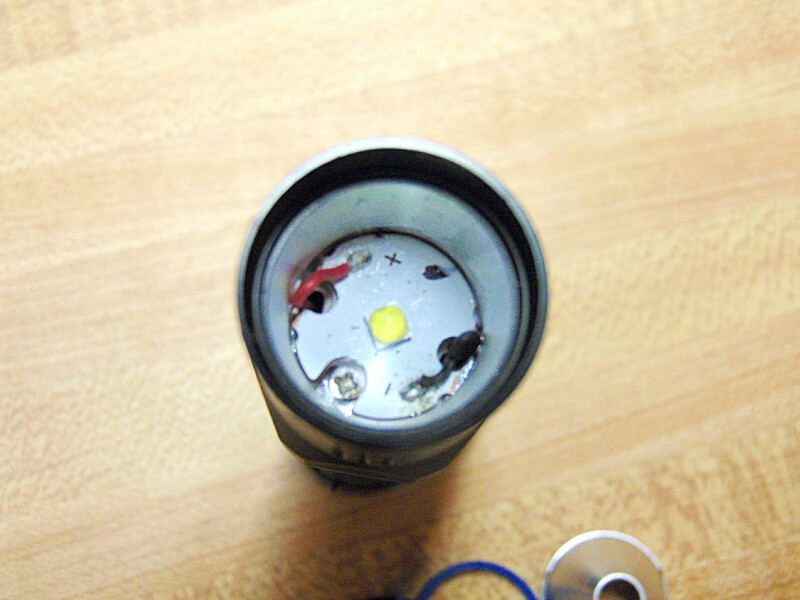 I’m not sure if this is an isolated incident with my light only, or all the M2R’s do this. I am just wondering if you got a little trickle of saliva down in there somehow that cause a short? I checked with a Key, a penny and even a piece of Turnigy wire when I did the review , from the center of the switch button to the edge on the outer part beside the button trying to get a short and never did. Well with heart rhythm problems and having had a heart attack already , I think I will skip possible shocking for now. I just tried to get mine to turn off by putting a piece of wire against the outer ring and the tail switch button itself and I cant get mine to go of when it is on . nor get any kind of short when it is turned off either. EDIT: A wet Q-tip laid across there don’t do anything with the light on or off either one. hmmmm……got me scratching my head over this now. Just a thought (or 2) is the insulator inside the tailcap damaged or rolled on the edge anywhere? and also try putting the end of your finger inside the tube and kind of spin it a bit to see if that may stop the short. EDIT: Also make sure the plastic wrap on the cell itself is not peeled off on the edges anywhere as that could possibly let contact be made that shouldn’t be inside the light? Not real sure with the double tube design which way to go to check things. The insulator is fine, battery is fine. The internal tube just rotates and falls out if I want it too. That could be the problem with the tube. It is supposed to have a lip so that it does not come out and only rotates with very little up and down movement at all. On mine I can barely feel the tube move up or down although it moves easily to turn it round inside the outer tube. I’m on the smartphone. Battery about depleted. Power outage going on. I got out thr MI boxer C4-12 and popped a freshly charged cell in slot 4, then con ected my phone with the charge cable. VIOLA….charging!! I sent you a PM also. I read Olight glues the threads. Yea all my Olights are glued pretty tight , other than a bezel here or there. You can get them apart without damage sometimes , but always a risk of damaging something when you start forcing them apart. Yeah, I don’t want chance damaging it. The bezel comes right off easy enough without carnage. For the time being I custom cut a sheet of notebook paper for around the inner tube. Worse comes to worse I have some vinyl acetate sheet I can cut to fit as a barrier.